About a Chair by Hay is a collection of chairs with remarkable simplicity regarding the design. The designer Hee Welling reached a new level of combining form, function, comfort, details and aesthetics with it. The chairs of the About a Chair Collection by Hay are simple and modest and that’s the reason why they can easily be combined with all types of furniture. Their simplicity is also responsible for why the chairs fit in every surrounding and architectural style, which is why the chairs are also predestined to be used in the object area. According to the idea of Hee Welling, the About a Chairs should be suitable for restaurants and canteens as well as for offices, for dining tables at home or conference tables. That’s why the idea of the simplicity guarantees multifunctionality and the ability to easily combine. The AAC 53 is the height adjustable version of the popular chair by Hay – the seat height is adjustable between 42 and 56 cm fluidly, without steps. The seat with armrests of the About A Chair AAC 53 is made of polypropylene and upholstered with foam according to the Eco-Tex standards. Different qualities of Kvadrat fabrics are possible for covering the seats. 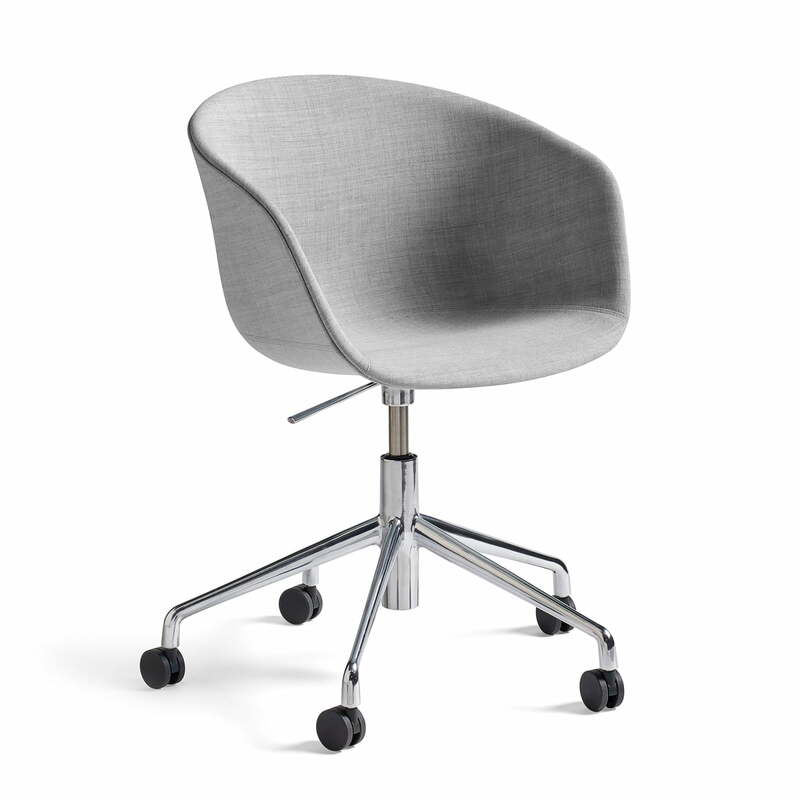 A five-star base of polished aluminium is the bottom of the chair,also available in black or white. The height adjustment is easy, by means of loading the chair, or reliving it while pulling the lever under the seat. The castors on the swivel chair complete its flexibility. The adjustable chair by Hay is also available without upholstery as AAC 52 edition. The About A Chair collection by Hay is available with further seats and bases, like AAC 50 with the same base and seat without armrests: The seats and bases of the AAC series result in numerous combinations, which never appear coincidental or undesired. We will gladly advise you on your personal configurations.